About Mark Pasley, in Australia. Before I tell my story...I'm the Mark Pasley in Queensland, Australia. Hopefully you were looking for me and not the other Mark Pasley in California, who is also a complementary health therapist...he's a good bloke too. 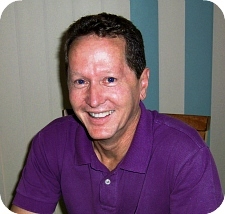 I decided to add this page as people often ask me how I got started along the path of energy healing. Sometimes I scratch my head and wonder the same thing. If you had approached me in 2005 and described what I'm doing now, I simply would not have been able to comprehend it. Perhaps you will understand when I describe some of my history. 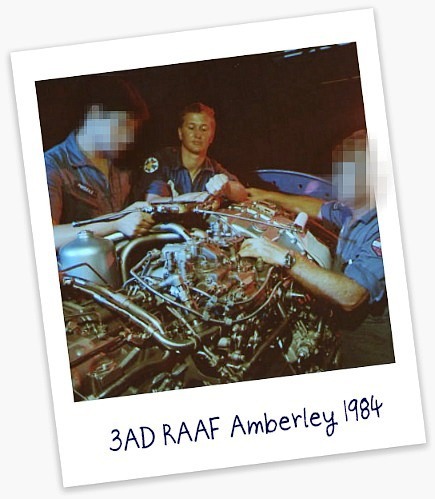 I left high school after studying maths, physics, and chemistry, to join the Australian Air Force and begin a career as an engine fitter at the RAAF School of Technical Training. Again I was back in the classroom studying gas pressures, fuel flows and aerodynamics. I spent roughly eight years as an engine technician maintaining the now obsolete F111 fighter, bomber. A young Mark working on an inverted Pratt & Whitney TF30-P3 engine from an F111C aircraft back in 1984 at RAAF Base Amberley. No.3 Aircraft Depot was formed in 1942 and was eventually merged with No.482 Maintenance Squadron in March 1992 to form No.501 Wing. It continued to provide maintenance support for the F-111's until 2001, when Boeing was awarded the maintenance contract. At about age 28, I decided on a career change and went back to school to study dental technology, courtesy of the RAAF. This time I was studying anatomy, physiology and basic nutrition at the School of Biological Sciences in Sydney. Many years later, looking for another change, I completed a Diploma in Applied Clinical Nutrition under Dr Laz Bannock MSc, CISSN, CSCS, in the UK. 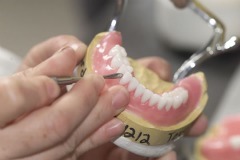 Student waxing a lower denture in college. While advising clients on dietary changes, I came to realise that many people could not break free from their negative eating habits. So I decided to find some tools to help people create positive lifestyle changes. That's when I decided Neuro-Linguistic Programing (NLP) and hypnotherapy were just what I needed. I earned my masters certification in NLP and was certified in Ericksonian hypnotherapy, which I then incorporated into a more holistic approach to helping clients with positive dietary and lifestyle changes. Looking back, I realise that a very large part of my education has been delivered by doctors of science and medicine, to whom I am truly grateful. They have been doctors of medicine; biomedical implants; research; nutrition; metallurgy and material science. Even my training in advanced NLP and hypnotherapy was delivered by a medical doctor, a surgeon in fact. Thus, my education and hence my career, has been very technical and fully referenced by science, so to speak. Not a glimmer of "alternative" therapy to be seen anywhere. That all changed in 2006 when I met a plumber from New Zealand who introduced me to the modality of energy healing. It was during some advanced NLP training in Brisbane when our paths crossed. Definitely not a doctor, but with many years of experience in the field of energy healing, he introduced me to another world that can't be described by medical science. My ability to see energy blockages was awakened, and over the following months I was introduced to what can only be described as Shamanic experiences. From one particular encounter, my image of the world and what I had always held as true, was shattered. Safely cocooned in my masculine, analytical world, I was not prepared for my reality to be abruptly turned upside down and shaken till all the pieces fell out. That particular encounter is a story for another day, but suffice to say, it took me quite some time to rearrange those pieces. Today, my image of reality is not the same. My world is not the same. It's a world of multi-dimensional healing. It's a world where contact with other beings is common, and it has completely changed the focus of my life. With that change of focus, I have looked at many healing modalities and sought the guidance of many knowledgeable people. I have had the good fortune to work with people from all over the world and have experienced some amazing phenomena. I now believe that no single person has all the answers, although many say they do, and that every person has an innate wisdom or knowledge of healing. I feel I have a role to some extent, in helping people connect to that inner wisdom. As with all things my work continues to evolve, and that evolution has brought me to this point in time. I am blessed with the fact that I am now working with my wife Chris who brings a whole different level of skills to a healing session. For those who often ask, what is it that we do exactly? We simply describe it as helping people to release the life experiences that are holding them back, whether it be from a past life or their current journey. So that's my story in a nutshell. I continue to witness some astounding phenomena, and I hope you can join us at some time to share your experiences. Flaxton on the Sunshine Coast hinterland.